White color solvent free sealant of acrylic base. It presents exceptional flexibility. Suitable for filling perimeter joints around aluminum, wood and painted metal frames. 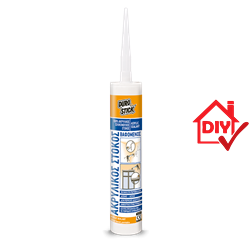 Necessary for painters, for sealing joints of interior and exterior casements as well as plaster repairs before coating with emulsion paints or undercoats. Distinguished for its high adhesion and its long lasting flexibility. When applied on outdoor surfaces, coat with elastomeric acrylic paints, such as D-80 HYDROSTOP elastic, and THERMOELASTIC COLOUR, to avoid cracking in the surface of the paint.